The Weekend Novelist Rewrites the Novel makes an excellent companion to Ray’s The Weekend Novelist (TWN). But, what if you haven’t read TWN? You still could follow this book — thanks to its 11-page detailed glossary. The book also includes a witty rewrite-in-progress of a draft — a draft that had been completed without its author having read TWN. literary classics like Pride and Prejudice, Jane Eyre, and The Great Gatsby; and a few genre novels like Gorky Park and The Eye of the Needle. The second edition of The Weekend Novelist begins by noting: “Writing a novel in the twenty-first century is made complicated by the world of screens. It wasn’t like that always….Screens have changed the writing world. When the writing world changes, the writer must change.” To learn the new complications in the craft, I studied both editions of TWN. The Namesake: A Novel by Jhumpa Lahiri (film adaptation,The Namesake DVD). Yes, the second edition does teach more complex plot-structures. Michael Chabon’s The Adventures of Kavalier & Clay is a great favorite of mine as I fully agree with his aesthetic that “a work of fiction must be first of all entertaining” (A recent conversation at UC Berkeley library). Another great favorite is Jhumpa Lahiri’s The Namesake, especially its cyclical plot structure. However, if you are plannig a linear plot structure, the TWN first edition (now out of print) might be adequate. The rewriting guide schedules 20 hours each weekend for 17 weeks for rewriting — at least as many hours as scheduled in TWN for completing the initial draft. I found no particular merit in long sessions on weekends and reverted to the equivalent schedule of daily three-hour sessions. 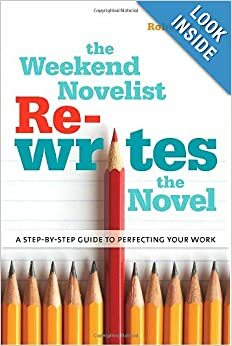 Although The Weekend Novelist Rewrites the Novel could serve as a guide by itself, it’ll clearly be more effective as a follow-up to the second edition of The Weekend Novelist.